You don’t need to wait, you can start right now. This is what you can learn right now: CANNING. Canning is a way of preserving food. A way us Homesteaders use a lot. Why? Because we do not want to waste any fruit or vegetables, we have worked so hard for to grow. Anything you can not eat right away you can preserve by canning. All the basics you need to know about canning are described in this blog. 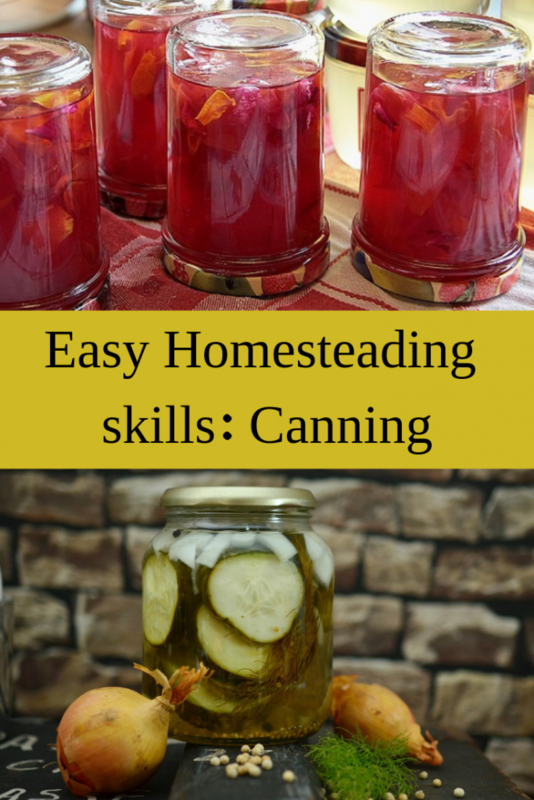 Why you should learn canning if you want to start a Homestead. Why canning is something for you and not something to be afraid of. A short overview of the most common ways of canning. A simple way of canning for starters. What do you need for canning? And how to spend next to no money on it. How to make your canning into a success and do it savely. Vinegar, salt and sugar three basic preservers and how to use them. 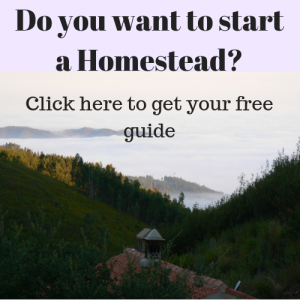 Why canning if you want to start a Homestead? When selling a vegetable is hard because everybody has it. When you live in a climate with cold winters. What can you can in jars with a metal screw on lid? How to make your canning into a success and do it save. Clean and sterilised tools, lids and jars. How to preserve food by canning: the basic principles. How to use vinegar, salt and sugar. An example of using vinegar, water and salt. More Ways of Preserving Food. As a homesteader you would most likely have a vegetable garden. Hopefully it will provide you with enough vegetables for the whole year. In our case we can grow vegetables year round, so it is a matter of planning the garden right to have food the whole year round. Sometimes however, it happens that we have a lot of a vegetable and we are not able to eat it all. In that case we could sell the surplus, you would think… But often when we have a lot of a certain vegetables our neighbour has the same problem…and not only our neighbour. A lot of people in our neighbourhood will have a lot of that vegetable, so we can forget selling it. In that case canning is a solution. By canning we save some of the vegetables for later. This will enrich our diet, we will have more variety on the table year round. Maybe you live in another climate, more up north, where the winters are too cold to grow vegetables. In that case you will have to grow everything in the spring, summer and autumn. If you want to have vegetables from your own garden in winter too, you will have to preserve some. Canning is one of the easy ways to preserve food. It is the cheapest as well. So as a Homesteader of the future you will most likely have a vegetable garden and be canning your own vegetables. Because it is an easy skill that you can learn anywhere, why not start learning it now. It will save you a lot of stress later when you will have the pressure of growing vegetables that want to be harvested. But what are you going to can when you do not have a vegetable garden? Well: buy cheap seasonal local vegetables. I made a blog on seasonal cooking that also covers the topic of buying local and seasonal vegetables. Check my blog on the topic, click on the link: Learning Easy Homesteading Skills: Seasonal Cooking. You don’t need to be a canning expert to do some canning. It is like driving a car, everybody can learn it. It’s one of those old skills that was very common in every kitchen. It is best to start small and simple. You don’t need to do 50 jars at the time like grandma used to do. Sometimes I just do 5 jars of something. Like what I do with red beets, I love them pickled. Usually we do not have so many in the garden at a time. We grow them well spread year round. Sometimes I manage to harvest some when nobody bothers about them and I make a few jars of pickled red beets. It does not take much space in the kitchen and it is done in no time. So that is how you could start. Buy a kilo of some vegetables, like carrots or red beets and can them. Really it does not need to be a big deal. And if it goes wrong, no problem, you only lost a kilo of carrots and some time. Canning is a very controllable process. With the right hygiene and some things to stick to you can can. When done right the losses are minimal. Canning in jars with a metal screw on lid. The types will overlap each other a little. My experience is that canning in jars with a metal screw on lid is the simplest way of canning. You do not need any special stuff for doing it, except maybe a funnel for filling the jars. And even that one is optional, however very practical. Watch the short video in which I show you what jars I mean and what is special about them and what you need to know about the lids. Can you can anything with this canning method? Pretty much. The only thing I never managed is to can green beans or cabbage, somehow that is more complicated. The other thing you can not do is add milk or dairy products to the things you want to can. Jars with a metal screw on lid is probably the jar you have seen most in your lifetime. You can find it in any grocery shop. These jars you can reuse for canning. It is very likely that you buy some product in such a jar, so the only thing you need to do is: do not throw them away. You have to keep the jar and the lid. After using the lids a few times you will have to change them. I always have some new jars in stock so I can change the lids. Here is were you can buy lids (scroll down). When you are on your own it might take awhile before you have enough jars to can something. If you want to hurry up: ask a friend if he or she wants to save some jars for you. What else do you need? Normal kitchen stuff: a pot to cook vegetables in, a pot for sterilising the lids, a spoon, a special funnel, towels, heat grips, an oven. Heat grips are save to use. It is a special grip that you can use to take the jars out of the hot water. Click here for the grip. The filling of the jars needs to be done without staining the rims of the jars. The special funnel is a great help to keep your jars clean. Essential for canning is that you work super clean. The surface that you are going to use needs to be wiped with a clean wet, soapy cloth. After that it needs to be dried with a clean dry cloth. Make sure there are no bread crumbs left behind on the surface. Bread crumbs contain yeast and yeast will spoil your canning. When you start the process make sure you have washed your hands. Do not forget to clean your fingernails as well. It seems to be a bit overdone, but it is not. Working super clean just means you will not lose your precious canning work. A small breadcrumb or a little dirt can spoil your product. Jars, lids, special funnel, spoons and other tools need to be well washed either with hot water and soda or in a dishwasher. Rinse everything well with hot water since you do not want to taste soda in your canned vegetables. Then dry it with a clean cloth. After that the jars and tools have to be sterilised. For the jars I use the oven, the rest, including the lids I put in boiling water. Do not sterilise the lids in the oven, because they will not work any more after that. The oven is set on 100°C for 10 minutes. To preserve food vinegar, salt or sugar is added. The reason is that an acidic, salty or sweet environment oppresses the growth of bacteria. The whole principle of canning is that you start clean, with sterilised material. Then you fill your clean jars either with hot dish and seal it. Or you fill it with a warm dish and heat it in a water bath. The temperature needs to be 100°C to sterilise your dish in the jar, or it needs 73°C for pasteurising the dish in your jar. I will not go into the details of the differences here, but you will find out that most recipes are based on either of the two. There is a difference in approach between U.S. Recipes and European recipes. I believe both works. There are more save guards then you think in the whole canning process. One of the most important save guard in caning in jars with a screw on top is that the lid clicks into vacuum. When the lid comes out of the vacuum before you have opened the jar, it means the content of the jar is off. See the video above where I explain this. The heat is necessary to kill yeast, fungi and bacteria at the start after that the vinegar, salt or sugar will safeguards your dish from going off. Bacteria that for some reason survived the heat have no chance to grow. If you would use pure vinegar for canning, your canned vegetable would get very sharp. To get a balanced taste in your canned produce it is recommended to delude the vinegar with water. To get a balanced taste for every 1 liter of vinegar you would use 400 ml water and 40 grams of salt. You could say this will result into a very basic pickle. To give your produce more taste you could add herbs and spices like garlic, black pepper seeds, mustard seeds or chilly. This will depend on your taste and on the recipe you are using. You can experiment with different things. Fill some jars with well washed vegetables, leave about 2 – 3 cm of space at the top. Poor the vinegar, water and salt in a pot (if you want add some herbs and spices). Heat it until it is boiling. Poor the hot liquid into the jars with vegetable. Leave a head of liquid above the vegetables. Turn the jars upside down for 10 minutes. Label the jars with date and content. Keep the jars for at least 3 weeks before you use them, this will add to the taste. Store in a cool place. What is often done to make your canned product even more tasty is to add some sugar to the vinegar water and salt. This will result in a sweet sour pickle. Herbs and spices that are often added to this combination are coriander seeds, anis, ginger, black pepper seeds or dill. Using vinegar, sugar, water and salt works the same as just using vinegar, water and salt. The only difference is that in no 2. in the example you add the sugar. How much sugar you want to add is a matter of taste. I usually add 4 or 5 table spoons on every liter of water. But je can go up to 300 gr of sugar. Another way, that is mainly used for fruit is using sugar to can. You can either make a sugary liquid to preserve whole fruits in or make jams and jellies. To can fruit, like apples, small pears or any other firm fruit you can make a heavy or light syrup. A heavy syrup recipe is based on 1 kg of fruit, 1 liter of water with 1 kg of sugar. Add a bit of lemon juice. You can make it even more tasty by adding ½ l of port wine. For a lighter syrup you can use 1 kg of fruit, 1 liter of water and 500 grams of sugar. Also add some lemon juice. Divide some pieces of fruit or small fruits in jars. Like 4 small jars. Boil 250 ml of water and add 250 gr of sugar for a heavy syrup. Or 250 ml water with 125 gr of sugar for a light syrup. Leave the syrup to cool down a bit so it is manageable. Poor the hot syrup into the jars over the fruit. Leave a head of liquid above the fruit. Put the jars in a pot and fill the pot with water so the lids of the jars are still just above the water level. Place a cloth under the jars to prevent them from breaking. Bring the pot to near boil, at 75-80°C and keep it at this temperature for 20-30 minutes. You can mesure the temperature with a thermometer that is used for cooking. Turn off the heat and leave the whole thing until it cools down (lukewarm to cold). Take the jars out and dry them well. Leave them a bit to become really dry. The lids of the jars should have popped vacuum. If not the process did not work. Keep the jars for at least 3 weeks before you use them, this will add to the taste. For making jam you can use almost any fruit. You will have to take the stones out of the fruit. Some fruit might make a better jam without the peel. Since jams & jelly making is a whole story on it’s own, I will not proceed here. Jam making, you could say, is also a way of preserving food using a lot of sugar. That is why I mention it here. It is possible to can fruit and vegetables with no additional at all. Except some lemon juice. To keep canning save, some additional acid is necessary. The other thing is that you have to work with boiling hot produce. One of the things you can make without using additional things is apple sauce. You will have to make an apple sauce from a mixture of sweet apples. Fill the sterilised jars with apple sause and close the lids while the apple sause is still hot. Close the lids firm. Turn the jars upside down and leave it for 10 minutes. This way the air in the jar above the apple sause gets sterilised. This stops the sause from going off. When the jars are cold label them with a date. Now you know the principle of canning like using heat, vinegar, salt and sugar. With the instructions in the blog you should be able to do your first canning. Collect some jars. Something like 15 jars would be a good start. Go to the supermarket around the corner and buy some cheap vegetables, like carrots and onions. Follow the instructions of the sweet sour pickles. For the amount of liquid that you need you have to make an estimate. I usually use a third of the volume of the jars for the amount of liquid. 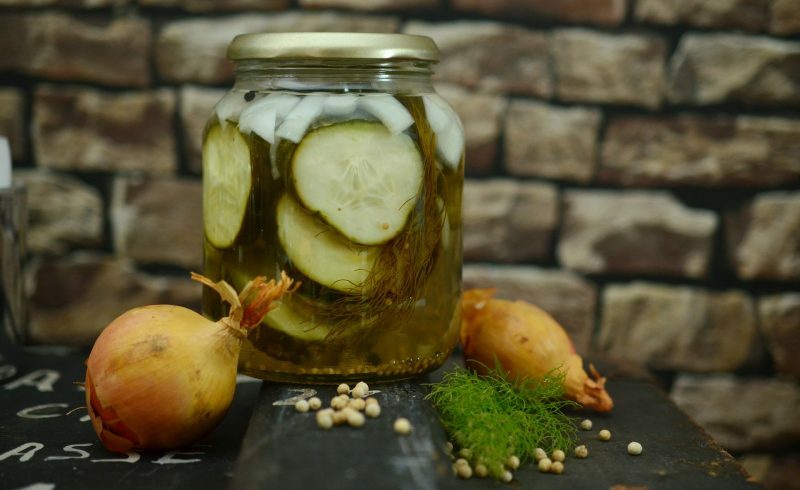 So say you need 1/2 liter to top up the vegetables in the jars, you will need: 300 ml vinegar, 125 ml of water, 15 gr of salt and a tabel spoon of sugar. I do not make an exact calculation. It’s just more or less. Do the same again with other vegetables. Try an apple sause with or without sugar. Make some fruit on light syrup (like strawberries, yummy). Try some nice recipes and adjust the recipes to your taste or to the ingredients that you can get for cheap. Be free and try.